Manchester United moved up to sixth in the Premier League as Juan Mata's second-half goal secured victory over stubborn Crystal Palace. There was little between the two in the first half, with Fraizer Campbell lobbing over for Palace and Luke Shaw denied for the hosts. 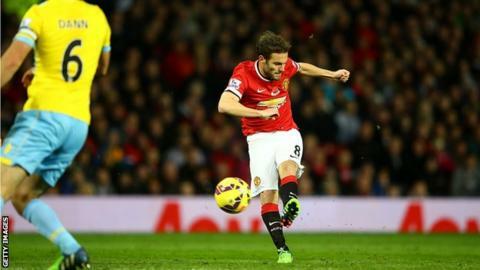 United boss Louis van Gaal brought on Mata after the hour and he made a swift impact, driving in from 20 yards. Mata hit the post later but his earlier goal proved enough to take victory. It was far from a memorable spectacle but three points and a clean sheet will prove satisfying for Van Gaal, especially given his side's defensive problems. An unsettled back line had played its part in United enduring their worst start to a Premier League season, having collected just 13 points from their first 10 games. Chris Smalling's sending off against Manchester City last weekend, coupled with an injury to Marcos Rojo, meant Van Gaal - not for the first time this season - had to name a makeshift defence, with Daley Blind partnering 19-year-old Paddy McNair at the back. Their unfamiliarity alongside each other almost proved costly in the first half, as a long ball from the Palace defence bounced between the pair for Campbell, who tried to lift his shot over David de Gea, but the effort ended up on the roof of the net. That, though, was the highlight of an otherwise forgettable first half, with United dominant in possession but struggling to make it count. Luke Shaw had the hosts' best opportunity before the break, breaking from halfway but his low drive was tipped behind by Julian Speroni. Palace had lost three of their previous four games but, to their credit, they were doing well to nullify United's attack. As a result, set-pieces looked to be the home side's best chance, and only a clearance on the line from James McArthur prevented Marouane Fellaini from powering in a header from Wayne Rooney's corner. With a draw looking increasingly likely, Van Gaal brought on Mata for Adnan Januzaj and, four minutes after his introduction, the Spaniard picked up the ball and steered in a left-footed finish. Palace never looked like scoring an equaliser, and instead Mata could have added further gloss to the scoreline but his late shot smacked against the post. "It was a fantastic goal but it was important also. It is always difficult to attack against a defending team, who come here to defend and not attack. You have two rows of four and we created a lot of possibilities. "We are having that kind of spell at the minute, nothing is going right for us. If Fraizer Campbell had scored that chance he had it would have put a lot of pressure on them, but it was not to be. I thought the referee did well today. Match ends, Manchester United 1, Crystal Palace 0. Second Half ends, Manchester United 1, Crystal Palace 0. Substitution, Manchester United. Darren Fletcher replaces Patrick McNair. Substitution, Crystal Palace. Kevin Doyle replaces Fraizer Campbell. Attempt blocked. Daley Blind (Manchester United) right footed shot from outside the box is blocked. Attempt missed. Wayne Rooney (Manchester United) right footed shot from the left side of the box misses to the right. Assisted by Robin van Persie. Dwight Gayle (Crystal Palace) wins a free kick in the defensive half. Attempt missed. Robin van Persie (Manchester United) right footed shot from the left side of the box misses to the right. Juan Mata (Manchester United) hits the left post with a left footed shot from outside the box. Attempt blocked. Robin van Persie (Manchester United) left footed shot from the centre of the box is blocked. Assisted by Wayne Rooney. Substitution, Crystal Palace. Barry Bannan replaces Marouane Chamakh. Substitution, Crystal Palace. Dwight Gayle replaces Yannick Bolasie. Corner, Crystal Palace. Conceded by Marouane Fellaini. Attempt blocked. Scott Dann (Crystal Palace) header from the centre of the box is blocked. Assisted by Jason Puncheon with a cross. Corner, Crystal Palace. Conceded by Michael Carrick. Attempt blocked. Fraizer Campbell (Crystal Palace) right footed shot from the right side of the box is blocked. Assisted by Joe Ledley. Attempt saved. Damien Delaney (Crystal Palace) left footed shot from outside the box is saved in the centre of the goal. Assisted by Fraizer Campbell. Substitution, Manchester United. James Wilson replaces Ángel Di María. Attempt missed. James McArthur (Crystal Palace) right footed shot from outside the box is high and wide to the right. Goal! Manchester United 1, Crystal Palace 0. Juan Mata (Manchester United) left footed shot from outside the box to the top right corner. Assisted by Ángel Di María. Attempt blocked. Jason Puncheon (Crystal Palace) left footed shot from outside the box is blocked. Assisted by Adrian Mariappa. Attempt blocked. Ángel Di María (Manchester United) left footed shot from outside the box is blocked. Assisted by Daley Blind. Antonio Valencia (Manchester United) wins a free kick in the attacking half. Substitution, Manchester United. Juan Mata replaces Adnan Januzaj. Attempt missed. Marouane Fellaini (Manchester United) header from the centre of the box is too high. Assisted by Wayne Rooney with a cross following a corner. Corner, Manchester United. Conceded by Marouane Chamakh. Corner, Manchester United. Conceded by James McArthur. Attempt blocked. Michael Carrick (Manchester United) right footed shot from outside the box is blocked. Assisted by Adnan Januzaj with a cross. Hand ball by Robin van Persie (Manchester United).